As we begin the new school year, it is worth taking time to remind ourselves about health habits for your kids. Habits are hard to break. That’s why the sooner in life we build good, healthy habits, the easier it is to keep them and stay as healthy as possible for years to come. And when good habits are in place, it’s easier to resist bad ones. Below are my top 10 tips for creating healthy habits in your kids. Reflect on your own habits. Your child’s habits start with you. You are your child’s most important role model. If you have unhealthy habits such as smoking or emotional eating, start this process by identifying what changes you can make in your own life. Perfection is not a realistic goal. Self-awareness and intentional choices, though, help us to become our healthiest versions. Remember, the healthier you are, the healthier your child will be. You have a golden opportunity to influence your child’s lifelong eating habits by starting early. If your kids are brought up used to the tastes of freshly prepared foods that are unsalted and unsweetened, they’ll most likely not care for artificial tastes later in life. If your kids are older, though, all hope is not lost! Change takes time, but bodies adapt and will grow to crave fresh foods. The less sugar we have, the less sugar we want! Stay positive. Be strengths based. It is easy for kids to get discouraged when things don’t go their way. Help them learn resilience when they experience setbacks by showing them the importance of staying positive. According to research in the Clinical Child and Family Psychology Review, children as well as adults can benefit from positive thinking and good relationships. Help your kids develop healthy self-esteem and a positive mindset by teaching them that they are lovable, capable, and unique, no matter what challenges they encounter. When things don’t go well for your children, whether they didn’t finish their homework or they got in trouble at school, emphasize the decisions that they made rather than the quality of their character. In other words, you child can make bad decisions but that doesn’t mean that he/she is a bad person. Separating these two is extremely important for the development of your child’s identity and level self-confidence. Make eating colorful. Eating foods of different colors isn’t just fun — it has health benefits too. Help your kids understand the nutritional value of including a rainbow of colorful foods in their regular diet. To be clear, this doesn’t mean that every meal needs to have every color, but you should make an effort to incorporate a range of fruits and vegetables of different hues into your child’s diet throughout the week. Let the colors range from red, blue, and orange, to yellow, green, and white. Remember, kids love to have fun with food, so be creative in the way it’s presented to them. Kids also love to “dip” food, so give them different dips, like hummus, guacamole and yogurt or a cheese sauce to dip veggies into. If at first you don’t succeed, don’t give up! Sometimes it takes a number of times for kids to be willing to try something new. Lastly, use creative language for healthy foods, like “grow food” – all kids love to hear about growing and if you convince them that they need “grow food” to grow instead of junk food, you are off to a good start! Be Active. The best way to get your kids to not be couch potatoes is to pick physical activities that they enjoy and to be active with them. Running or going to the gym isn’t for everyone. Skipping, doing cartwheels, exploring on a nature walk or going through a sprinkler, though, might be easier to ‘sell’ to your kids. And, the more you offer to be active with your kids, the more likely they are to join in. Modeling physical health and exposing your kids to a variety of activities will help them to find their own healthy niches and develop habits that they will carry into adulthood. The best way to motivate your child to get off the couch is for you to do the same! Limit your device time when you are with your child and set boundaries around electronic use when together e.g. not at the table, not before bed and not when someone else is talking to you; it sounds obvious, but in can be hard to do! Read every day. Developing strong reading skills is an essential component of your child’s success in school now, and at work later in life. According to the Cleveland Clinic, reading helps build a child’s self-esteem, relationships with parents and others, and success in later life. It is recommended you make reading a part of your child’s playtime and bedtime routines. The Cleveland Clinic also suggests that daily reading to children can begin as early as 6 months of age. Most importantly, choose books your kids like so that they view reading as a treat rather than a chore. Drink water, not soda. You can keep the message simple. Water is healthy. Soft drinks are unhealthy. Even if your kids don’t understand all of the reasons why too much sugar is bad for them, you can help them understand the basics. The best way to ensure water is an essential component of your child’s diet is to start the habit early. With babies, it should be the first thing offered after breast milk or formula. Hold off on juices. If your child has already gotten used to sweetened drinks such as juice, then start by ensuring you are giving him/her 100 percent fruit juice with no added sugar or artificial colors. Next, gradually water it down until the juice is mostly water. This will help to wean your child off slowly and without much protest. Remember, since your child is drinking mostly water, this means that you have to also! Your child will fight you more on the decision to stop drinking juices or soda if you still have a can of soda at every meal! Creating a solid bedtime routine. A research study from Dalhousie University in Nova Scotia indicates that it only takes 4 nights of non-routine behaviors to lead to sleep deprivation. Set the stage for bed. Screens, devices and electronics should not be in your child’s bedroom. Research indicates that these devices are detrimental to falling asleep and lead to less restful sleep throughout the night. Conduct sleep audits every now and then. Log how many hours your child sleeps along with how many tantrums, meltdowns, and hours of electronic use your child has. You may be surprised about the correlations you find! Family Meals. With hectic schedules, it is hard to find time to sit down and enjoy a meal together, but that doesn’t mean that we all shouldn’t try! For many of us, family meals nights are not realistic. Instead, aim for 3-4 home-cooked, family meals a week. The other nights you may get take-out or go out to dinner. Finding a balance is important, but make sure that you don’t forget the value of eating as a family. Share and Give. Talk about helping others from the start. Usually by your child’s second birthday, he/she will be able to understand the concept of sharing toys and giving to others. One habit that I am proud of is that for every present my children receives on their birthdays, they choose one to give away to other kids in need. My vision with this practice is to develop an association between receiving and giving. Sharing toys, clothes and time are healthy habits that children can start learning young! 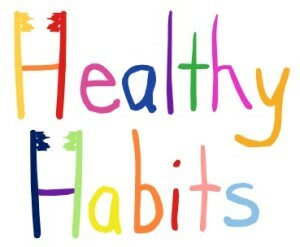 As I said at the beginning of this article: your child’s healthy habits start with you. If any or all of these tips seem overwhelming to you, they will feel the same way to your child. Start small and gain momentum. Some change is always better than no change. Start with one change – maybe no sodas or eating a healthy breakfast, get comfortable and consistent with that change, and then move on. If you try to change too much at once, it is likely that you’ll become discouraged and give up during the process. Healthy habits are a lifelong journey that we’re all on. Finding balance and making intentional choices related to health is the goal that each of us tries to achieve on a daily basis. If you keep these 10 tips in mind, you are more likely to be successful in doing so!